I have a wonderful partner in crime named Scarlett, and she runs Lucky Scars. It’s a healing center out here on Long Island and she’s pretty awesome! Anyway, she and I are teaching Tarot on Monday evenings and on Wednesday mornings. We’ve just completed teaching our first 6 week class and I don’t think I’ve ever enjoyed anything so much. If you’re in the area and are interested in learning to read cards and how to trust your own abilities, please give us a call or look us up. Check out our Facebook page or twitter @ultimatetarot Hope to see you soon!! 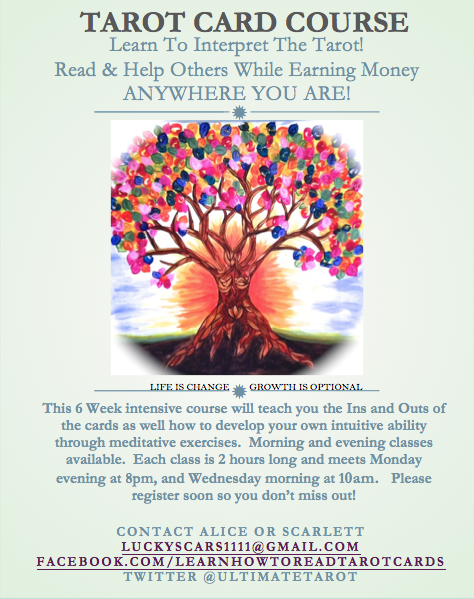 This is the class that brings you to a new level of Tarot greatness! Plus it’s a lot of fun.